Today we raise a spoon in honor of a creamy companion unlike any other. A hero in our fridge. An all-star in the kitchen. 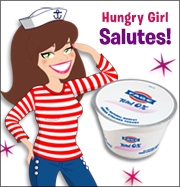 Fage Total 0% Greek Yogurt... WE SALUTE YOU! SOOOO much protein! Seriously. A whopping 15 grams in a 6-oz. serving?! That's WAY more than ordinary yogurt. Awesome! It's a terrific swap for creamy condiments. Try using it anywhere you would use sour cream or mayo, for an equally tasty but more nutritious treat. Spoon it onto a baked potato, slather it on a sandwich, whatever! It's multi-talented like that. This stuff is thick, creamy, and delicious. You might think that's kind of a "doy" statement, but we've tried several other brands of fat-free Greek yogurt, and there's a reason we keep going back to this one. Some are runny. Some taste sour. This is the BEST by far. It's a great base for sauces, dips, desserts, and dressings! Sure, we like to eat it from the container (with a little Splenda swirled in) as a spoonable snack, but it's SO much fun to zazzle it up and use it in other ways. 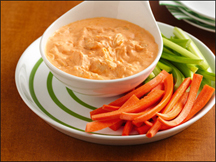 Stir in some salsa for a quick veggie dip, or go all out with our cream cheese 'n Buffalo chicken concoction. Blend it up with berries for a fantastic smoothie... or for our wacky-sounding yet delicious fruit soup! Toss in some Fuji apple chunks with cinnamon and no-cal sweetener. Or add some spices and a little liquid (like garlic powder and BBQ sauce or lemon pepper seasoning and lemon juice) for a fast 'n easy dressing or dip. It makes a freakishly good marinade. Not in the "soak it 'til it tastes good" way. In the "dredge it 'til it's madly tender" way. Try it with our Chicken D'lish Kebabs. Do it. Sugar-Free Pancake Syrup - Flapjacks everywhere are INSANELY jealous, but our friend Fage does enjoy quality time with this sweet goo. Think of it as a delicious alternative to squeezing sugar-packed honey onto lackluster yogurt. Sugar-Free Preserves - If you like your yogurt fruity, we recommend a spoonful of preserves swirled in. The best part is that, depending on your personal stash of SF spreads (ours is rather extensive), you can combine a few to concoct neat-o creations that you'd never find on the shelves. Who's up for sugar-free peachberry yogurt? Meeeeeeeeeeeeeee! Tuna - Yogurt doesn't have to hang out with sweet things all the time! It helps make an EXCELLENT tuna salad, too. The tanginess of the yogurt cuts out the need for a squeeze of lemon juice, and it packs in all the creaminess of mayo (possibly more). It's genius. Plus, just THINK about the protein! Freeze-Dried Fruit - Hydrated fruits are good, sure, but if it's texture you crave, this power-duo will be a welcome addition to your food world. You get crunch AND flavor along with the knowledge that your snack is so guilt-free, it's ludicrous. 14-Carat Cupcakes - Pssst! The yogurt goes into the frosting. Sneaky, eh? My Big Fat Greek Pita - It's big... It's fat... But it's NOT fattening. YAY! 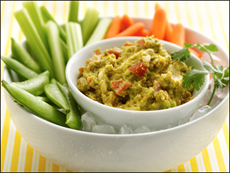 Hungry, Hungry Artichoke Hummus - It's a Hungry Girl 200 Under 200 exclusive! Grab your copy and check out the recipe on page 110. Compared to ordinary hummus, ours has TWICE the serving size! Or HALF the calories! Depends on how you wanna look at it. Either way, it tastes good. Today is November 19th, or National Carbonated Beverage with Caffeine Day. Silly? For sure! But we think we'll crack open a Coke Zero to celebrate. 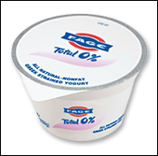 Has your friend been eating the same kind of yogurt since the '80s? Click "send to a friend," and give that pal a snack-makeover!